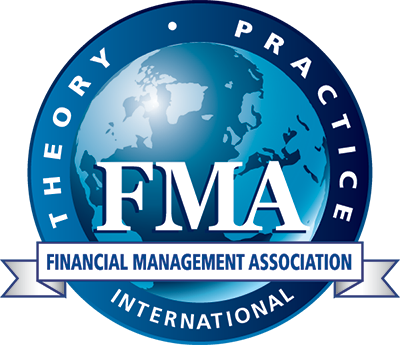 Established in 2000, the FMA Fellows Program recognizes individuals who have made significant contributions to the profession such as distinguished scholarship as evidenced by someone's contributions to the literature throughout his/her career or supervising PhD students, writing books, editing journals, or through work with professional associations like FMA. Click here to view the FMA Fellows. Established in 1984, Outstanding Financial Executive Award honors individuals who have made creative and innovative contributions to the field of finance. Click here to view the award winners. The Innovation in Teaching Award is designed to recognize inspiring educators, enhance the quality and relevance of education in finance, disseminate successful innovative practices, and elevate teaching as a craft to the next level. This competition is open to any educator who teaches undergraduate or graduate students in finance. Click here to learn more. Awarded for FMA's international conferences, competitive paper awards are based on a combination of reviewer scores from the initial paper evaluations and recommendations of the respective program's track chairs. Click here to view all conference awards. Recognizing the importance of our Associate Editors to the smooth and effective operation of the journal through their timely, detailed, and supportive reviews, the Editors recognize Associate Editor(s) for exemplary efforts each year. Click here to view the most recent winners. The Editorial Board of Financial Management recognizes the top three (3) papers in each quarterly issue of the journal. Click here to view the recent winners. Every two years, Financial Management’s Editors, Associate Editors, and Advisory Editors choose the best papers from all of the journal articles published during the past two years through a double ranking procedure. Thanks to the generous support of Pearson, the winner is awarded a cash prize of $7,500 and the runner-up paper is awarded a cash prize of $2,500. Click here to view the recent winners. The Collegiate Fellows Program recognizes outstanding chapter members who have made meaningful contributions in service to their chapter and/or college throughout the year. For more information and to view the most recent winners, please click here. Founded in 1974, the National Honor Society (NHS) is the only internationally honorary society specifically for finance students. Induction into the NHS demonstrates academic excellence to potential employers and helps set you apart from others when pursuing your first job after graduation. Click here to learn more. The highest honor for an student chapter is the attainment of the Superior Chapter designation. Of the 175+ active student chapters, less than 10% receive this honor each year. For more information and to view the most recent winners, please click here. The Superior Faculty Advisor Award recognizes outstanding faculty advisors who have made meaningful contributions to their student chapter through their involvement. For more information and to view the most recent winners, please click here. Excellence in chapter membership development and National Honor Society membership development are recognized through the Membership Development Awards. For more information and to view the most recent winners, please click here.